Testo Australia’s Service Department consists of highly qualified service engineers ready to repair or service your Testo instrument, should the need arise. Our service engineers are highly regarded for their expertise and always strive for excellence. Customer satisfaction is always paramount to us. Testo’s average turn-around time for repair is among the best in the industry. Let our service engineers repair your measuring instrument to your satisfaction. 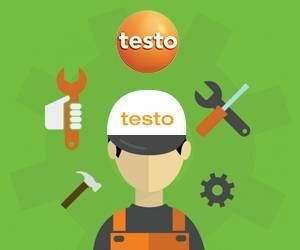 If you need to repair your Testo Instruments, simply download the Instrument service, calibration and repair form which is located on the right side of this page, complete the form and send it to us along with your Testo Instrument. Upon receiving your instrument and following its inspection, one of our service engineers will be in contact with you. What do I need to do before sending the instrument to Testo for a repair? You would first need to download the Instrument service, calibration and repair form from this page and follow the specific instructions on the form. How do I send an instrument for service, calibration or repair? Once you have completed the Instrument service, calibration and repair form, simply place the form and all documents (proof of purchase) and return to the address below. How can I contact the Testo service department prior sending in my instrument? What's the time frame on Testo warranty? The following time limits apply to instruments and accessories in Australia. Please note: Warranty repairs do not extend the period of warranty. For further information please read our terms and conditions.